We have been planning all of the lovely traditions that we would like to start as a family in the run up to Christmas. We want to celebrate Advent and really teach our children the meaning of the nativity, as well as beginning some homely, family activities that we can revisit each year. First of all we sat and talked about Christmas and what we would all like to do. C was very keen to mention hot chocolate, sweets, cakes and presents (no surprise!). Daddy really wanted to make sure we included Christingle services, singing carols and learning Bible passages together, to keep the Biblical focus. I also wanted to include old fashioned traditions and lots of crafting and baking. Between us, we came up with lots of ideas, but 24 will do- one for each day of December! 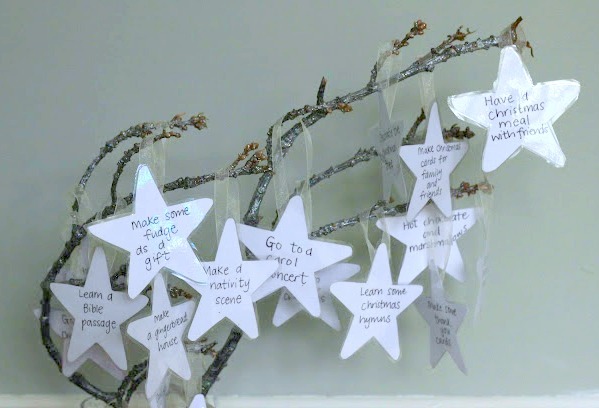 I drew around a star shape cookie cutter onto white card and wrote out all of our ideas onto the star shapes. Then I simply laminated them, cut them out and stuck a loop of ribbon the the back of each one with sticky tape. I thought I would be able to punch holes through, but the hole-puncher wasn’t able to cope! 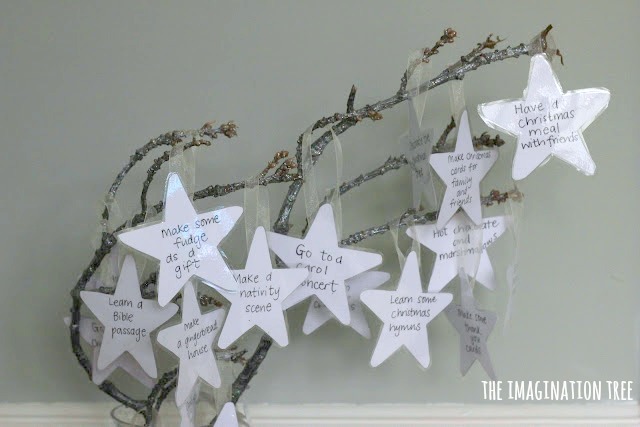 We painted a tree branch with a tiny bit of silver glitter paint and hung the activity stars onto it, ready to choose one for each day in December. I didn’t number them so that we can be flexible (and realistic) about what we can achieve each day. I hope this will be one of our new family rituals each year and maybe we can even recycle the same stars for next Christmas too! * wear Christmas pyjamas around the fire and toast marshmallows! 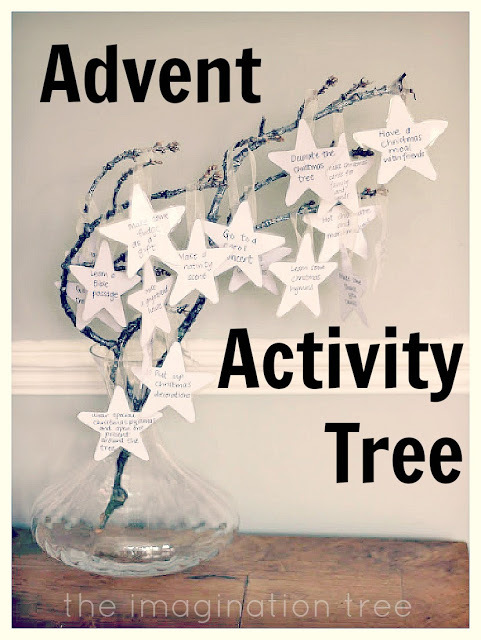 Have YOU made an Advent activity calendar? What sorts of ideas would you include in yours? I would love to hear your traditions! for more inspiration this Christmas! 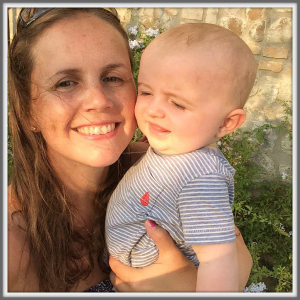 Focus on the Nativity: Celebrating the Christmas Message with Kids! 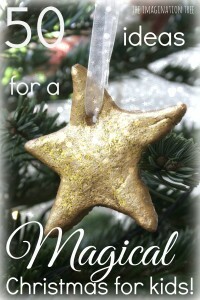 20+ Christmas Activities for Kids! « 30 Days to Hands on Play Challenge: Dressing Up! What a special tradition. I love learning about the different ways people prepare for Christmas and the traditions they have. 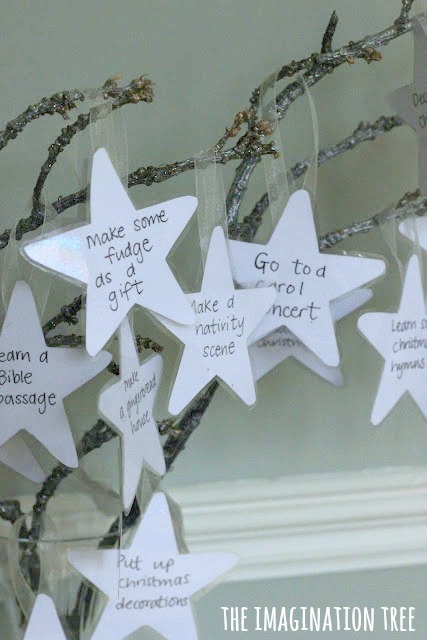 Last year, I simplified our Advent activities. 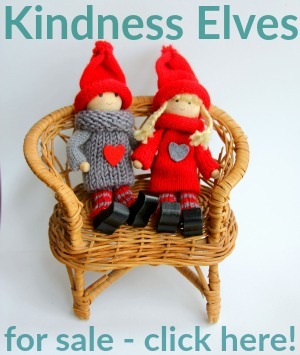 I made up a booklet with 25 activities and divided them into categories – traditions, giving, creating, sensory as well as reading and writing. If you are interested in this (or downloading the booklet) you can use the link below to my blog where I wrote about it. What a lovely tradition….my twins are a little young as yet but i am going to keep this one in mind! Oh my! How adorable! I LOVE you tree!! We are doing the baby sock calendar this year… but I have to say, your tree is FABULOUS! So so lovely. What a great idea – we have a reindeer that I sewed up last night with mini envelopes of the activities – iit’s a tradition that I wanted to start with my children this year as well. 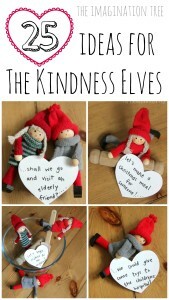 This is a lovely idea – much better than one of the ever-present chocolate advent calendars. I love the way the whole family can get involved in choosing and doing the activities. Wonderful idea. My son is a little too young this year but have bookmarked this to use next year :o). Have you come across Jesse trees? I think you can buy little cards but you could make your own as well. Each day of ‘advent’ tells of part of the gospel story- from creation to Christ’s coming- or so I believe. A lovely way to keep little minds learning the truth. I love this! We did something similar a few years ago but I didn’t think to use a star cookie cutter! How smart! I really like some of your ideas. Some of them I didn’t include on mine because they were “no-brainers”, like set up a nativity scene, but I could/should totally include that as one of our activities. I’d like to add the “have a Christmas meal with friends” and “learn a bible passage” to our list for next year for sure! This has really inspired me. Thank you. My classroom now has one with a special Christmas play activity/craft for each day left before we break up. Each of the children has made a snowflake and I have added the date and an activity to each one. Such a good idea! I love this and I absolutely love your site!!!! Well done and Congratulations!!! I really like this idea as an alternative to just eating chocolate every day. I shall ask my husband if we can do it too! I also looked at your Christmas sensory tub. I have an 8-month-old and this, and lots of your other ideas, falls down when she continues at this age to put literally EVERYTHING in her mouth! It’s like she’s testing everything in the world to see if it’s food or not. Please help! I would love to do this but not sure how to find things that won’t poke/cut/otherwise injure her in the process. What would you put in a Christmas sensory box for her? Vey Cute! 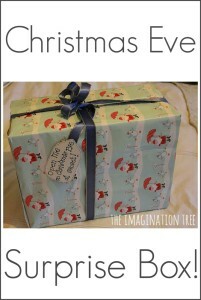 I love the tree idea. Just popping in to say Hello! Take care. I love this. I am curious as to what a “Christingle service” is? And if you take photos of the family participating in the activities you can print them to build up their enthusiasm again next year! Thanks for sharing so amazing ideas!